I’m Chris Killebrew and I joined the Jay-Crew team as a Relationship Manager for the Indianapolis office. As a child growing up in Lincoln, Illinois, I’ve always loved working outdoors, and my first job was mowing neighborhood lawns. While attending Southern Illinois University, I operated a tractor and bush hog mowing interstate medians for First Class Lawn and Landscape. 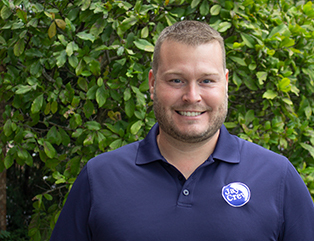 I moved to California for a couple years after graduation before relocating to Indiana and returning to the commercial landscape industry, where I’ve worked as an Account Manager for Brickman Group and Wild Ridge Lawn and Landscape. As a Relationship Manager for Jay-Crew, my role is serving as the main point of contact for our clients so that we can provide remarkable service on every project. I enjoy the ability to work with the elements of the earth to transform a site into something beautiful while exceeding expectations and gaining the trust of our clients. Having been in the commercial landscape industry for the past 10 years and enjoying what I do, I look forward to the solid, core values of Jay-Crew and the team members that make the company. My wife and our two children reside on the south side of Indy and attend Indian Creek Christian Church. In my free time, I love being with my family and deer hunting with my brothers. I also work on lots of projects around our home and do mechanical work in my barn.